The 2019 Cadillac CTS is the American alternative to luxury sedans like the BMW 5 Series. It is sporty but trails rivals in many aspects. The 2019 cadillac cts electric vehicle qualifies for a federal tax credit of up to $7,500, effectively reducing the net base price. The 2019 Cadillac CTS is the American alternative to European and Japanese midsize-luxury sedans like the BMW 5 Series and Lexus GS. With its variety of engine choices, taut handling and distinctive design, it is worth considering if you deeply desire a domestic alternative. That said, competition is fierce in this segment, and newer, fresher, more feature-rich sedans are fighting for attention, from the long-respected Mercedes-Benz E-Class to the upstart Genesis G80. For the moment, the CTS and its high-performance CTS-V variant (reviewed separately), can at least still hang with these rivals. But with the possibility of Cadillac ending production of the CTS after 2019, this sedan’s outlook isn’t promising. If you’re in the market for a midsize-luxury-sports sedan from an American company, the Cadillac CTS fits the bill. With its rear-wheel-drive architecture (all-wheel drive is optional), and powerful engine choices, it also performs like a sports sedan. Starting under $47,000, the CTS also undercuts its German rivals. The Cadillac CTS lacks the very latest semi-autonomous driving systems, such as the Super Cruise found in its larger CT6 sibling, and some of the brand cachet of rivals. Its residual value is poor, and perhaps more important to consider, the CTS may be discontinued after this model year. The Cadillac CTS carries over unchanged for 2019. Cadillac (and General Motors in general) is in the process of discontinuing several sedan models. Cadillac has already confirmed the axe for the ATS compact sedan, and the midsize CTS could also face the chopping block as the brand focuses on new SUVs and other more desirable models. Using the same platform as the smaller (and discontinued) ATS sedan and despite its own added size and weight, the CTS feels unaffected. The agile handling inspires confidence, and overall feels relatively light and lithe. Opt for Cadillac's Magnetic Ride Control and you can tailor the ride for enhanced smoothness or stick-to-the-pavement stiffness. While we prefer rear-wheel drive for its fun manners, there's no denying the available all-wheel-drive system expands the all-weather capabilities of the CTS. You'd think the base 2.0-liter turbocharged 4-cylinder would be underwhelming, but the reality is it offers surprising acceleration and slightly better economy than the standard 3.6-liter V6. The 2019 Cadillac CTS comes with a nice roster of helpful tech. In addition to the Cadillac user experience (CUE) infotainment system, there's Apple CarPlay and Android Auto phone integration. The CTS also features a Wi-Fi hotspot, wireless phone charging, and even a system to monitor your teen's driving habits. This CTS splits the performance levels of the standard, 335-horsepower V6 model and the asphalt-melting CTS-V with its 640 ponies. Available in rear-wheel drive only, the CTS V-Sport packs a twin-turbo V6 that makes 420 horsepower. The Cadillac CTS sedan’s 5-passenger interior features premium materials, fine assembly quality and high-tech touches. Virtually everything is soft-touch and covered in leather, although base models get Leatherette (as do base models from Europe). The inviting ambiance is also as uniquely American as the exterior. The same is true for the rear seat, but be warned: There's a shortage of legroom compared to its primary rivals. Cadillac's CUE touch-screen system has improved remarkably over the years, and its quick response and seamless integration with iPhones and Android devices are second to one. Our favorite over-the-top touch: a power sliding cover for the cup holders. Sharp creases, a rippled hood and a prominently geometric grille on the 2019 Cadillac CTS stand in contrast to the softer curves of its European rivals. It stands out for all the right reasons, looking distinctive and luxurious, but also uniquely American. Cool exterior details include grille shutters that pragmatically close to help improve aerodynamics and fuel economy, and we particularly like the seamless aluminum trim around the side windows. At the rear, all CTS sedans feature dual-exhaust outlets. Wheels range in size from 17 to 19 inches. Cadillac’s CTS for 2019 comes in five trims: base, Luxury, Premium Luxury, V-Sport, and V-Sport Premium Luxury. At its most basic, the CTS sedan comes with 8-way-power front seats, dual-zone climate control, keyless access and push-button start, universal garage remote, and rear parking sensors. The infotainment system is solid, featuring an 8-inch touch-screen display, 11-speaker Bose audio system, wireless phone charging, and Apple CarPlay and Android Auto integration. Notably absent on base and Luxury trims of the CTS -- and not even available as options on these versions -- is automatic emergency braking. To get this important safety feature, which is standard on some rivals and even mainstream Toyotas and Hondas, you have to step up to a $61,000 Premium Luxury trim, then pay extra as part of the Driver Assist package. 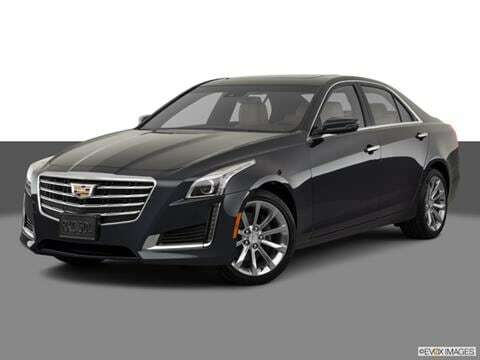 We’d recommend stepping up to at least the CTS Luxury trim, as it adds the Driver Awareness package with safety features like lane-keeping system, blind-spot monitor, and forward-collision warning. It also adds navigation, leather upholstery, heated and ventilated front seats, 13-speaker Bose audio, sunroof, heated steering wheel, 60/40 folding seat (optional on base models), and high-intensity headlights. CTS Premium Luxury trims add automatic parking assist, tri-zone climate control, magnetic ride control, 12.3-inch digital dashboard, and the option for front and rear automatic emergency braking. The top-line V-Sport packs a powerful twin-turbo V6, performance suspension, upgraded Brembo brakes, and other go-fast hardware. All-wheel drive is optional on all but V-Sport trims. Three engine choices are available for this main Cadillac CTS model. The base engine is a 2.0-liter turbocharged 4-cylinder with 265 horsepower and 295 lb-ft of torque. The mid-level engine, a 3.6-liter V6, has 335 horsepower but a less-substantial 285 lb-ft of torque. The CTS V-Sport is the most rewarding with its twin-turbo 3.6-liter V6 that pumps out 420 horsepower and 430 lb-ft of torque. All models are rear-wheel drive (RWD) as standard, and the base 4-cylinder and naturally aspirated V6 can be had with all-wheel drive (AWD). All models use an 8-speed automatic transmission, and it's a gem, responding quickly to the steering-wheel-mounted paddle shifters. The 2019 Cadillac CTS has a Manufacturer’s Suggested Retail Price (MSRP) starting just under $47,000 for a base 4-cylinder rear-wheel-drive model. Destination charge regardless of model is an additional $995. The more recommendable CTS Luxury trim begins at $52,695. The Premium Luxury variant is over $60,000. V-Sport CTS models with the twin-turbo V6 begin over $61,000, and the top-spec V-Sport Premium Luxury model rides in at over $71,000. At its base price, a new Cadillac CTS starts thousands below German luxury rivals like the BMW 5 Series, Mercedes-Benz E-Class, and the freshly revamped Audi A6, not to mention the American-made, all-electric Tesla Model S. It’s nearly the same as a Lexus GS, and slightly below a Jaguar XF. Still, the bargain in this segment is the highly laudable Genesis G80. That vehicle from Hyundai’s luxury division starts just over $42,000 and packs a V6 standard, plus a wealth of features and an exceptional warranty. Before buying your new luxury sedan, check the KBB.com Fair Purchase Price to see what others in your area are paying. The Cadillac CTS’s resale value is expected to be quite poor. 2014 Cadillac CTS Vsport- Love my car!!! Great car, awesome to drive. Incredible driving experience for the money. Best vehicle out of the 8 I have owned.